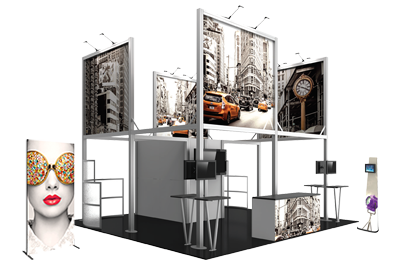 The Gemini 20ft x 20ft Island Orbital Express Truss™ exhibit is a towering modular display that features a number of display accessories, which pair exceptionally well with the heavy-duty steel truss frame. Comprised of two graphic towers connected by a central panel, Gemini rises 11ft above the show floor for an impactful display. Also included are four tabletops and monitor mounts that attach to the towers for additional digital messaging and display opportunities. 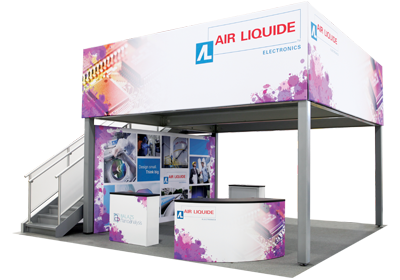 Two rectangular counters provide extra messaging and display capabilities. Gemini's towers are illuminated by eight low voltage spotlights that illuminate the exhibit. 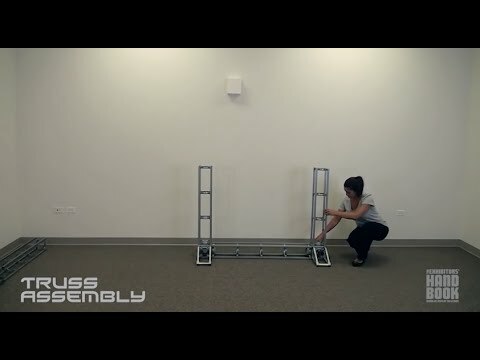 This versatile system can be reconfigured in multiple ways and combinations using the same parts. Choose from dye-sublimated fabric or UV printed rollable PVC graphics.